Only algo strategies are used in managing fund’s assets. These strategies are more stable in generating returns than manual strategies as robots experience neither emotions nor feelings. This way the core risk, a human error, is eliminated. Before employing a new strategy for managing fund’s assets we test it on proprietary accounts of United Traders for at least 6 months. Even after the massive work done when developing and selecting strategies, we still keep in mind that there are risks we might have missed. Therefore, a risk-managing robot tracks the strategies’ performance as well as a human risk manager. Working together, they are capable of identifying emergencies and timely terminating operation of a particular strategy. None of the strategies can cause a loss exceeding 3% of the fund’s equity. As a result, the risk of loss when investing into the hedge fund is similar to the probability of Apple, Google, Gazprom, or Sberbank, for example, going bankrupt within an hour. The probability of technical failures stemming from the fact that robots manage the fund is many times lower than human error risks. Members of the Board of Directors and fund managers invest their own money in Kvadrat Black together with other investors. As of summer 2015, funds of fund’s employees account for over 30% of the assets. You money is always at work during both stock market growth and decline stages. We charge a success fee every week and only if your investment portfolio has increased in value using High-Water Mark rule. As there are many trading strategies available at United Traders, we can pick the best ones for the hedge fund. 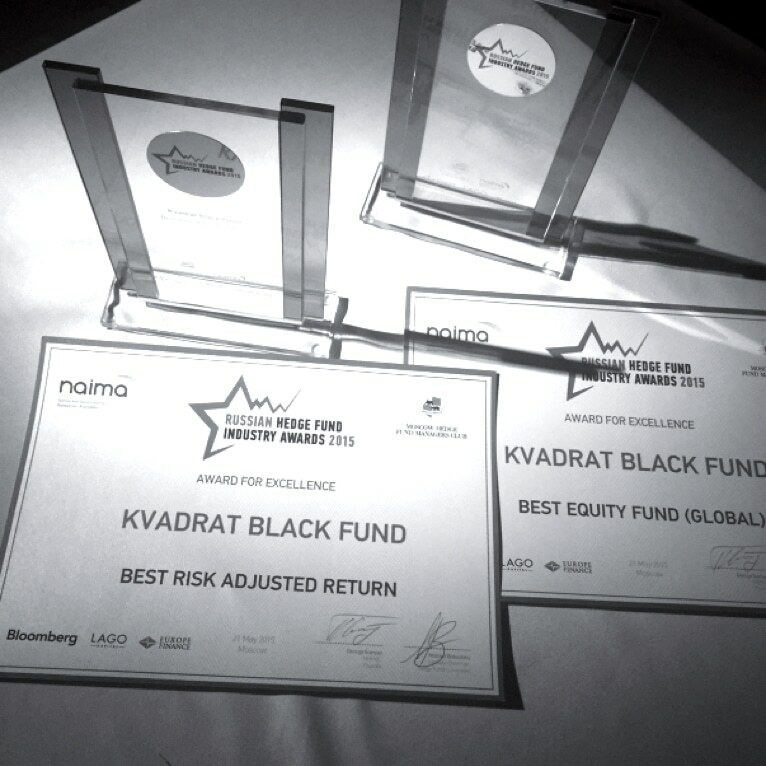 Owing to the above, Kvadrat Black hedge fund enjoys all the benefits that funds provide. 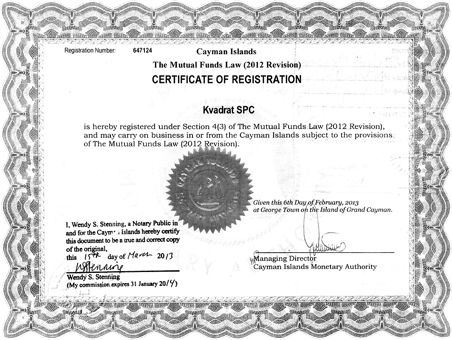 In 2013-2016, the fund's strategies managed Kvadrat Black SPC hedge fund. In the above period, the fund generated a return of 59.22% without substantial drawdowns. The prize is awarded to the best global equities fund. The prize is awarded to funds demonstrating the best risk/return ratio (with a 2.0 Sharpe ratio). The above means that in addition to high returns, Kvadrat Black’s performance was also very consistent demonstrating high efficiency of the employed trading strategies. Behind each of our strategies is a team of professionals. To implement any trading strategy a trader, a mathematician, and a programmer are required. In a joint brainstorming session, an idea is born. A mathematician builds a math model for the trading strategy and analysis its performance on historic prices. A trader is responsible for the applicability of mathematical models to the actual market environment. The trader answers the following question: Is it possible to buy or sell the instrument at a specific time and in the required amount as set forth in the mathematical model? If the answer is positive, the programmer codes this strategy, and then the strategy goes «live». Every strategy can change its properties depending on the phase of the market. We equip our strategies with AI features for them to be as consistent as possible. At least once a day, each strategy analyzes the market phase by 150 parameters and is optimized using new historic data; then, a decision to adjust internal parameters is made. All our strategies employ machine learning algorithms. Different strategy types have no effect on each other, and therefore, we manage to generate consistent returns even in an unfavorable environment for some of the strategies. Market-neutral strategies imply independence of returns from the overall market environment. Portfolios employing these strategies always comprise 50% long positions and 50% short positions. The total number of stocks in the portfolio is up to 2000. The portfolio is being continuously rebalanced. Stocks with an upside potential are added to the portfolio as longs, and those with a downside potential are sold short. These strategies seek extended stock price movements in a particular direction. As soon as the direction is identified, the strategy signals a trade entry. Positions are held from 15 minutes to 5 days. Applying the strategies on multiple timeframes and instruments ensures consistent performance. In addition to profiting from long-lasting movements (trend trading), these strategies also profit from short-term deviations from such movements (counter-trend trading).